Thanks to director Michael Bay and his money-making film series, Transformers have garnered a bad rep in the 21st century, however all isn't lost. The brand new trailer for Transformers: Destruction has got us pumped, appearing to be the nostalgia fest that die-hard fans have been waiting for. Created by Platinum Games and published by Activision, Transformers: Destruction is basically an 80's throwback in the form of a retro arcade-style beat 'em up. We've now got a brand new gameplay trailer to feast our eyes on, after debuting at this year's San Diego Comic-Con. And needless to say, it looks awesome, and a lot more than just a blast from the past. Not only is it inspired by the original cartoon – complete with a colourful art style, cheesy electronic music, as well as some of the original voice cast – but it also seems to be a sharp fighting game. There appears to be tons of fast-paced, melee action with plenty of combos to hit on your opponents including vehicle attacks, grabs, counters and slams. Now onto the character roster. You'll be able to play as five Autobot characters, including fan favourites Optimus Prime, Bumblebee and Sideswipe, as you're pitted against the evil Decepticons which includes Megatron, Shockwave and Starscream and many more. There's 30 characters in total, each with their own unique moves. The war begins after the summer, so get ready. 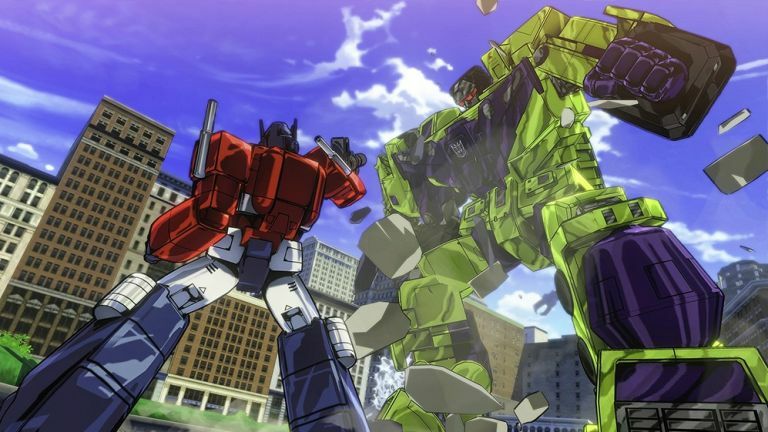 Transformers: Devastation will be out on PC, PS3, PS4, Xbox 360 and Xbox One on October 6. So far, so good for Transformers: Devastation, with reaction to the new trailer being universally positive. We can't wait to play it, but what do you guys think? Let us know in the comments or at the T3 Facebook page.